It's official: cookbooks have moved beyond paper and into the digital age. While you're certainly welcome to keep your paper cookbooks, their digital versions have some notable advantages: they're easy to search, have more images (and even video! ), and you never have to worry about turning a page. And while you may be worried about keeping your tablet grime-free—and a safe distance from the sink and other kitchen hazards—with a bit of care it's easy to keep your tablet safe even in the harshest kitchen environment. To celebrate the tablet's dominance in the kitchen, we've gathered 6 great cookbooks for your iPad or Android tablet that are sure to pique the interest of even the most paperbound chef. This is new, digital version of the popular How to Cook Everything cookbook includes more than 2,000 recipes with full color photographs and numerous how-to illustrations. It's a great cookbook, and it's made the transition to digital very well: providing high quality recipes that are easy to browse and search. Built into each recipe are a shopping list creator, temperature and measurement converters, and (possibly our favorite feature) a timer that will make sure you don't leave anything on the stove for too long. If you're not feeling particularly carnivorous, there's also a vegetarian version of the cookbook. Panna is a new kind of cookbook designed with your tablet in mind. It's published like a magazine, with one issue every other month, but formatted like a cooking show with a focus on video. Each issue contains 13 seasonal video recipes and two hours of video. 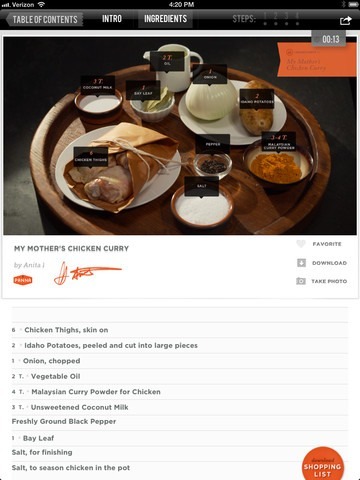 Unlike a cooking show, Panna has full-text recipes on the same screen as the video — and tapping on any step in the recipe will send you straight to the portion of the video where that step is discussed. Panna is a free download and you can sample one recipe per issue without charge — after that, issues are $4.99 each or $14.99 for 6. 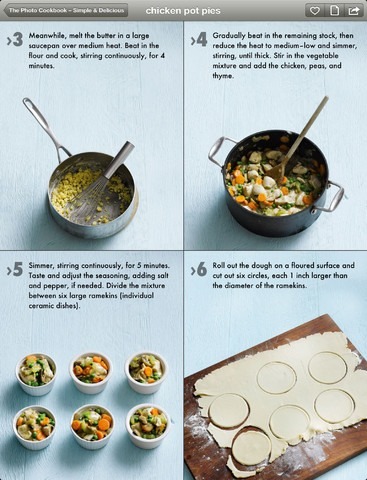 The Photo Cookbook is a collection of cooking apps that, as the name suggests, focuses on taking you through each step of the recipe with high resolution photos. This very visual cookbook makes recipes as straightforward as possible and is perfect for novice cooks. The Photo Cookbook collection has several different apps covering different cooking styles, including Quick & Easy, Baking, Tapas, Cocktails, Vegetarian and Simple & Delicious. The Quick & Easy version offers a $2.99 in-app purchase to expand its selection of recipes from 84 to 240.
iCookbook is your standard cookbook... but designed for tablets. It features more than 2000 recipes with new (free) recipes and for-purchase recipe packs added monthly. 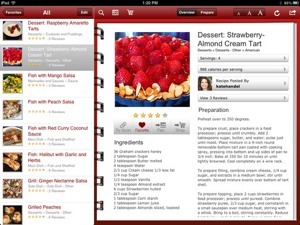 Its huge category of recipes is easily searchable by numerous categories. 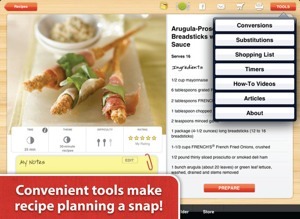 And, you can save your favorites in a personal recipe box, annotate them, share them, and even add your own recipes. You'll also find timers, substitution lists, conversion information and a shopping list feature — in short, everything you need. Unique to iCookbook are voice functionality, which allows you to use the app hands-free, and a Prepare mode, which displays information in a format that's easy to read from a distance (like when you're cooking). 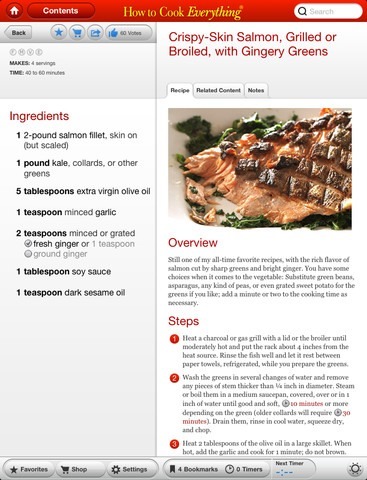 You may be familiar with BigOven as a website, but they also have an app that gives iPad and Android users access to their 250,000 recipe database. Search the recipe database by keyword, course, or ingredient; plan meals and menus; and shop for groceries. Big Oven is free, but you can also subscribe ($19.99 a year) to remove advertisements and gain access to more recipe tools and nutrition tools, like the ability to add your own notes on recipes and search recipes by dietary constraints. The Video Cookbook makes full use of its digital format by offering all of its 134 recipes with clear, descriptive video walkthroughs in addition to the standard text steps. It offers a basic set of tools otherwise, with measurement converters and a shopping list creator. But if you're using the app, it's because you're interested in the video—and this app does video very well. If you like the app, additional recipe packs are available for $0.99 each.